In Faria's flight across the world of Eeres, we get a lot of species diversity, but we don't get much cultural or topographic diversity. Where are the farms? Where is the livestock? Where are the wheat and rice fields? Not that I expect a travelogue, but I do like to see what our heroes are fighting for. A band of characters drives the plot. While I found the political structure vague (Aidan is the Emperor of a walled city? ), political intrigue is rather a small focus. At this point, our heroine doesn't need to be next in line to rule her country (empire?). It's rather more important that she's a resonator, her powers not yet realized nor perfected. Her faith in her father's decisions and righteousness hardly wavers during her discoveries of his history (and especially his role in making Nazreal the mysterious legend that it's become). And while she grows, and proves herself a fighter, I feel like she could have grown more. Or rather, I wanted to see more of her thinking as growth. When we first meet Faria, she is obsessed with honing her power and doing something with it. Being a resonator makes her something of an elemental mage. She can shape things, throw bolts of lighting, etc, but her power is limited. Her power is also a secret and she's forbidden to help her people with her powers. She's frustrated. When her home is attacked, she escapes to freedom, but also to a larger responsibility. I'm rather surprised (and pleased) when Faria recognizes unrequited love between two of her friends. I'm delighted that she takes action to help bring them together, but it sort of came out of nowhere. It could have been a moment in her growth, but it feels underplayed because this romantic insight doesn't speak to her past. Was she lonely in her royal role? Was she hungry for the gossip of the servants? I know it was probably a decision by the author to keep moving forward, but I liked her enough to want more. Speaking of wanting more; my favorite character is probably the cyborg Raccoon, Tierenan. He's very childlike and it makes me wonder how long he was part of the enemy's army, under some sort of mind control. His interactions at every level are precious... but I really wanted to know more of his tragedy. The enemy changed him, put things in his head, gave him new arms, a new ear, to improve him as a weapon, and (I'm assuming) because he grew under their "care". I was looking forward to seeing his reactions once they got to civilization and had a chance to look into the mirror. Tierenan was effectively raped and enslaved when he crosses Faria's path. The narrative glosses over the impact of abduction. He says that he doesn't remember anything, yet a hole in one's mind can be as terrifying as a horriffic haunting. For me, he's the character I have the most connection to, the character I feel the most sympathy for. Again, probably a decision to keep moving forward. Hugo Jackson has a lot of balls in the air in this book. There are two wolves who help Faria and Tierenan along, bonding with them almost instantly in what I might have called a "PC Glow Moment" in a pub, if it hadn't been written so well. It had a feeling of destiny rather than just forced coincidence. They're good companions, and make for a nice subplot that helps make the story and other characters more grounded in the affairs of the world's "normal" people. I feel like I got to know these two the best in our merry little band. I do have two issues. Both are the sort of furry things that I often hit against when an author is comfortable writing a multi-species setting that's relatively without intra-species strife. The first is emotional expressions. The gryphon, Osiris, blushes at least twice... I'm thinking his face is at least 30% beak and the rest are feathers, so how does that work? Gryphons are noted as unusual to our heroine, so it feels odd that she can read his facial emotions so well if it's some sort of feather-ruffling. Maybe avians aren't so unusual, but we only see one other beakface. Anyway, it threw me out of the story a little. Might not do that to other furry readers, but I think it might throw off a regular fantasy fan. Another problem I had was with species assumptions. I assumed that almost everyone was bipedal, I didn't make that assumption for Osiris, because I pictured... y'know, a gryphon. That might just be me, but I'd honestly do the same thing if a centaur, a unicorn, a snake, or a spider showed up hiding under a cloak. It didn't even occur to me that Osiris was supposed to be standing on his hind legs, until I wrote some notes for this review. This didn't quite distract me from the story, but it gave me trouble picturing some of the intense fight scenes. Perhaps in the next installments of The Resonance Tetralogy we'll learn more of its world, its politics and its peoples. Perhaps Faria will grow more. Perhaps we'll see more into the depths of Tierenan's character. Maybe there might even be a wedding or two? Right now, there's more than enough to draw me back for book two, Fracture. Happily, it's currently available in both physical and ebook formats! 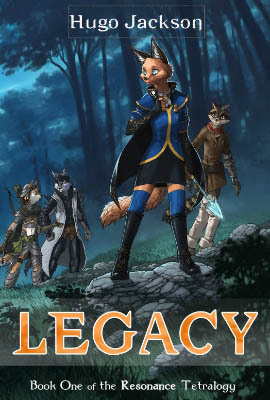 Here is my review of Legacy, and its sequel, Fracture. Holy sheeeeet........ that cover was made years ago by Minna, the woman who draws my favourite comic right now!